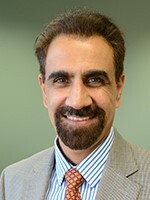 Parwinder Grewal, Ph.D., is the Executive Vice President for Research, Graduate Studies, and New Program Development at The University of Texas Rio Grande Valley (UTRGV). In this position he overseas UTRGV’s Research Enterprise, Graduate College, Library Resources, Online Programs, Continuing Education, Centers and Research Institutes, Global Engagement, Sustainability Office, and leads the development of all new programs. He served as the Founding Dean of the College of Sciences at UTRGV until March 2018 and oversaw the award-winning Mathematics & Science Academy, the nation’s largest UTeach program, the Center of Excellence for STEM Education, the Center for Gravitational Wave Astronomy, the Center for Advanced Radio Astronomy and the STARGATE program. Under Dean Grewal, the college underwent a major transformation, envisioning and building new academic units and degree programs, interdisciplinary research, education, and outreach centers, student success programs, and innovative local and global community engagement initiatives. The college established a new BS program in Marine Biology, two new MS programs, a new School of the Earth, Environmental, and Marine Sciences, three new research centers - Center for Sustainable Agriculture and Rural Advancement, Center for Vector Borne Diseases and the Center for Urban Ecology, and the new HIGH Scholars program that engages high school students in research with faculty. He also established a competitive Seed Grant program to enhance faculty research capacity, a Graduate Research Assistantships program to recruit high quality students, and the College of Sciences Annual Conference to share, disseminate, and celebrate student and faculty accomplishments. Prior to joining UTRGV, Dr. Grewal served as Department Head for Entomology and Plant Pathology at the University of Tennessee in Knoxville. There he established a new interdisciplinary doctoral program in Entomology, Plant Pathology & Nematology, and a shared-funding mechanism that doubled the size of the graduate program within two years. He received his Ph.D. from Imperial College London and post-doctoral training at Rutgers University in New Jersey. After working in industry for 4 years, he joined The Ohio State University where he worked for 16 years becoming a Distinguished Research Scholar in 2011. At Ohio State he also led the establishment of the Center for Urban Environment and Economic Development, the Urban Landscape Ecology Program, and the OARDC Research Internship Program (ORIP) for undergraduate and high school students.